PETA (People for the Ethical Treatment of Animals), responsible for launching the attacks at the end of 2011, is one of the most influential international organizations in the world, and has been fighting for the protection of animal rights since the early 80’s of the twentieth century. PETA members organize nonviolent actions: protests, pickets and demonstrations. Moreover, they issue numerous publications every year, and conduct widespread educational activity. The organization is also famous for frequent publishing of shocking videos on animal cruelty. Many players probably recognize the form of Mario in a raccoon costume, a rare item that gives him extra skills. The animal lovers’ organization does not approve - to say the least. "Tanooki may be just a ‘suit’ in the game, but in real life tanuki are raccoon dogs who are skinned alive for their fur. By wearing a Tanooki, Mario is sending the message That it is OK to wear fur”, says PETA’s exposé on the subject. On the Mario Kills Tanooki website you get to play a flash mini game (which by the way, is actually quite playable, and not too easy), clearly inspired by the original Super Mario Bros series. Only this time the tables are turned on the gaming world’s favorite plumber: a skinned, but alive Tanooki seeks revenge and chases the blood-dripping savage, who stole his fur and wears it as a suit. Obviously, Nintendo did not remain indifferent to this attack. The company issued an official statement, and expressed absolute conviction that the tanuki transformation of the mustached plumber Mario was never meant to send any hidden, fur-supporting messages. The company also pointed to the fact that both Mario and his younger brother, Luigi, often take the form of other animals (such as penguins, frogs) or objects (e.g., balloons). The idea behind these transformations is nothing more than to give Mario various additional skills, hence make the game more attractive for the players. Another title which apparently made PETA very, very angry is a popular console game Cooking Mama by Majesco. The players’ task is to prepare various meals from scratch. Sticking to a recipe, they have to chop, beat, slice, fry, grind, sauté, bak, and so on. Thanks to the interactive nature of the game, the virtual cooking training translates into real-life skills. It is the educational aspect of the program what substantially contributed to the huge success of Cooking Mama on the U.S. market. PETA believes that the game promotes cruelty to animals, and does not offer sufficient number of vegetarian recipes. 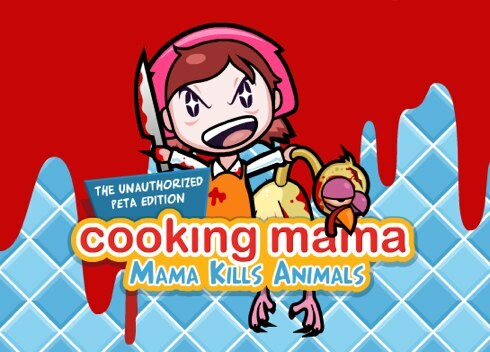 To strengthen their message, the organization came up with an imitation of the product, Cooking Mama: Mama Kills Animals. This simple skill game supposedly shows the real face of Majesco’s bestselling product. The launching of Cooking Mama: Mama Kills Animals purposely coincided with last year’s Thanksgiving, in order to draw awareness to the fate of many American turkeys in that particular time of the year. Player’s task is then to prepare the traditional Thanksgiving’s poultry dish: from plucking to stuffing. As PETA’s spokesman says: "There’s nothing funny about the suffering endured by turkeys and other animals who are killed for food". And apparently Cooking Mama encourages such terrible practices. Majesco clearly disagrees with PETA’s opinion. Company representative points to the fact that the latest upgrade to the game - Cooking Mama: World Kitchen - includes dishes from all around the world, including many (half of the total number) vegetarian recipes. Even though the game’s main character - Mama - is not vegetarian, she shows her strong support for the ethical treatment of animals. She herself is a caring dog owner. PETA, however, has been deaf to such arguments. The cruel variation on the game is still available on the official website of the organization. PETA surely cares a lot about animals. The organization acts in many different ways and areas, yet it is highly disputable, whether titles like Cooking Mama are really the most adequate objects for attack -- or if PETA doesn’t only hold itself up to ridicule for such actions. In comparison, their famous series of billboards with naked supermodels, protesting against wearing fur, seems to be way better thought ou and more consistent, than the rather random attacks on computer and video games.